In 2018 this became the fastest-selling Easter egg in the 114-year history of Waitrose & Partners. 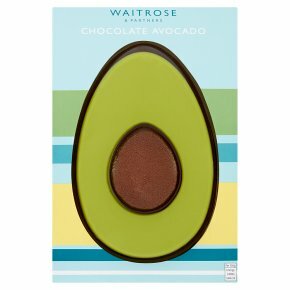 With its smooth Belgian chocolate shell, white chocolate ‘flesh’ (made green with natural colouring), and chunky cocoa-dusted chocolate ‘stone’, it’s easy to see why this fun, avocado-inspired Easter egg was a hit. And while it looks like a giant avocado, that’s where the similarities end – it’s all chocolate here! INGREDIENTS: Dark chocolate (84%) (cocoa mass, sugar, cocoa butter, emulsifier (soya lecithin), flavourings), white chocolate (14%) (sugar, cocoa butter, whole milk powder, emulsifier (soya lecithin), flavourings), cocoa butter, sunflower oil, potato maltodextrin, fruit and vegetable concentrates (safflower concentrate, spirulina concentrate, lemon concentrate, apple concentrate), cocoa powder, acidity regulator (citric acid), invert sugar syrup, sucrose syrup. For allergens see ingredients in bold. May contain: peanuts and nuts.